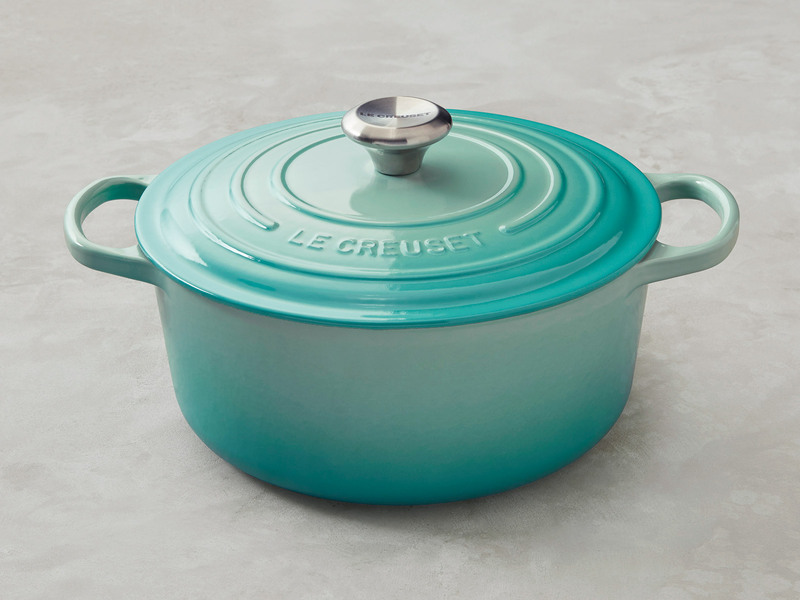 You'll fall in love with the latest color of Le Creuset's iconic Dutch oven. With the end of January nearing, Spring season is just around the corner—when the snow finally melts and the flowers bloom—and that means you may want to add a little something to your kitchen to brighten it up after months of chilly and grey weather. Le Creuset has just the thing to give your kitchen that springtime boost: a new line of appliances that comes in a mint color. The new range is a light ombre, almost seafoam green, that conjures images of Easter eggs hunts, tea parties in blossoming gardens, light salads made with spring produce, and colorful, refreshing cocktails. The minty Dutch oven—which doubles as a sure fire conversation starter at your next dinner party—will pair well with all those springtime activities. By now you’ve probably realized that the Le Creuset Dutch oven is probably one of the most coveted kitchen appliances out there (followed closely by the Vitamix blender and the Kitchen Aide stand mixer) and you’ve probably seen one sitting in the kitchen of your best friend, neighbor, sister-in-law, dog walker, and baby sitter, but the really appealing aspect of the new mint line is how well, different, it is from Le Creuset’s previous collections. It’s a stand out color, that will make you too stand out among the hoards of home cooks that already own a probably much more subdued version of this classic, must-have appliance. The other great thing about Le Creuset’s appliances is that while most of them elevate the common kitchen tool to high art with it’s timeless design, they’re also one of the most practical tools you can have on hand in your kitchen. Le Creuset isn’t simply for show—you’ll get you money's worth out its products. The line launches today exclusively at Williams-Sonoma so if you’re a fan of bright, cheerful colors that show off your more playful side, you might want to head over to the site now and check out the full collection.